On this blog, you'll see an eclectic mix of artists, from the established and well-known, to those who are just emerging and really starting to rev-up their activity. Joanie McGinnis is a painter based in Fairfield, Iowa who's been charting a steady course of growth and development. She stays connected with other artists in the area and just keeps on making work, undaunted by the fact that she's located in the Midwest. Untitled, 2012, acrylic and pumice on canvas, 24” x 24"
These two pieces are from Joanie's Windows series; 2012, acrylic on canvas, 10" x 20" each. PB: What forces or circumstances pulled you into art and how does art help you? JM: My first inspiration to create art came when my mother took me with her to weekly oil painting classes when I was 4 years old. The smell of the paint and the turpentine still lingers in my nose. The globs of rich color on her palette fascinated me. Throughout grade school and junior high I continued to enjoy art but it wasn't until I was in my freshman year of high school that I really dove deeper into art. I was selected along with a few other students to participate in a special project called "Project UP" which stood for "unlimited potential". The students that were selected were the top 1% of their class. We had about 1000 students in the class of 1981 when I graduated. Each of the students that were selected for this project were to pick one subject that they could explore more deeply to see if they could really develop that area. I chose art for my subject. During that semester I was able to do pottery, commercial art, print making, jewelry making, and batik. This really boosted my love of art even further. I continued to take as many classes in high school that I was allowed besides my regular studies. I took Watercolor I and II, Drawing, Printmaking (did acid etches, relief painting, block prints, silk screening), jewelry making I and II, Batiks, etc., etc. I also played the violin for 9 years starting in 4th grade so by the time I got to high school I had gotten pretty good at it. I was selected for the All State Honors Orchestra and was also selected to play with the St. Louis Symphony orchestra one time. It was a perfect adjunct to my fine art studies. When I approached my senior year my Orchestra Conductor wanted me to apply for a scholarship to Interlochen Fine Arts Academy. I thought about it long and hard but my true love was not music, it was painting and I really wanted to pursue becoming a fine artist. Needless to say my father and my violin teacher were not happy about my decision! Art helps me because it allows me a voice to express my love of life, my love of color, and my love of nature. It has always been a way for me to connect my spiritual feelings to something concrete. It helps me feel alive and connected with God. PB: Tell us about some artists you're excited about. JM: I love Hans Hoffman's work. His use of color is so inspiring! I also love Matisse, Monet, Van Gogh, and pretty much all of the Fauves. I feel a true connection with Mark Rothko as well. PB: What’s a studio session like for you? JM: Usually I listen to music while I'm painting. It gets my juices flowing and the cadence of the music directly reflects in the painting's style. Other times I will sit in complete silence and those paintings are much more subdued and minimalist. JM: I used to have a lot of frustration with watercolor. That is the medium I used for about 20 years. I don't know why I chose to start with this medium because anyone will tell you that it's the hardest medium to master but I guess it was the bright clear colors and the ability to let the light shine though in your work that attracted me to watercolor. JM: Light bulb moments....yeah I have them every time I paint!!!! JM: I have an extensive library of art books. I read them all of the time. At first I learned to paint solely by reading books so I was self taught at first. It was not until later in my life (in the early 90's that I started taking regular workshops and classes with other artists. That's when things really started to click when I was able to watch these masters and pick their brains. I listen to a wide range of music. My favorite is jazz. I love Miles Davis, Stan Getz, Brad Mehldau, Ahmad Jamal, Dave Brubeck and Keith Jarrett. Also when I really want to get pumped up for an abstract expressionist piece I'll listen to Santana. I've loved his music since the 70's! Lately I've been listening to Annie Lennox, Lily Allen, Katy Perry, & Nina Simone. I also like Michael Jackson, Van Morrison, George Harrison, Cat Stevens, Rufus Wainwright, Leonard Cohen, The Rolling Stones, Dire Straits, Stevie Wonder, The Temptations, and Paul McCartney. The list goes on and on. I have thousands of songs in my itunes library and can easily listen on my iphone anytime, and anywhere. I also regularly listen to Classical Music since I have that training having played in the Orchestra. I understand classical music and enjoy it very much. As far as my "looking" list... I regularly go to Art Museums to see the Master's work. I try to visit a major museum at least twice a year for inspiration and to get further insight into their work by looking up close at the brush work. I can stand and look at a single piece of artwork for hours, literally! My husband usually has to move me along since these museums have so many works, that standing at one painting for hours is not conducive to getting through the whole place in a day. I feel like a kid in a candy store when I go to a museum…feels like I have died and gone to heaven! PB: If you could pick one place to visit this year, where would you go? JM: If it was only one place it would be France, particularly the Provence region. My ancestors from my father's side were from Alsace Lorraine between France and Germany. My maiden name is Friese`. I have a connection with the French Artists and have always had a fondness for that region. I would love to stay on the French Riviera drinking French wines, eating artisnal cheeses and painting in the lavender fields all day long. Oh my that has got me thinking....I have got to go to this place. I can just imagine the inspiration I would feel in my heart and soul just doing that for even a week!!!! Professional skateboarders have a saying, “skate how you feel, not how you should,” and the most experimental and engaging artists have always operated just like that—working how they feel, not how they should. Currently, I see painters and others asserting their freedom and pushing the progression of painting in increasingly fresher ways. Specifically, I’m noticing more loosely hung, sometimes radically altered or reattached swaths of canvas (among other things) without need of being held taut and hung into place by stretchers. In other examples, the stretcher bars remain, but they’ve been reconfigured in diverse ways with vastly different intentions. But in the most arcane instances, paint has been applied to other objects altogether: utensils, detritus, you name it. It’s clear there’s no further pushing of the picture plane here, but some rather bracing yet energizing examples of painting post-plane. Working with canvas freed from its tidy confines forces one to confront a whole new set of variables: how it’s cut—or not, how it hangs—or not, and exactly how pigment is deployed upon it. In addition to considerations of paint, loose or rearranged canvas often involves sculptural issues. Stretcher bars reinforce the fact that a 2D ground has been prepared and readied for mounting. The absence or modification of that familiar hardware suddenly forces one to assess how an orphaned swath of fabric will hang in its spatial surroundings. A change or removal of supporting structure puts a painter into the position of a quasi-engineer because the painted surface no longer behaves the same way; instead, it begins to exist as an object to be tamed or dealt with so that it can be exhibited. So in many instances, working in this manner emphasizes the thing-ness of the thing at hand and advances the issue of image versus object and all other things in-between. The work of Tatiana Berg, Karla Black, and Sharon Butler is what I’ve had in mind lately. Berg has taken canvas and put in on wheels. 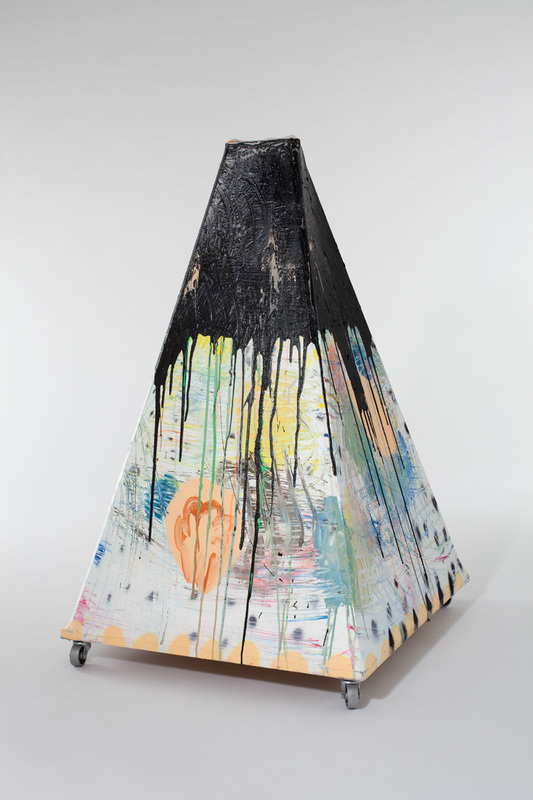 Her pyramid-shaped mounts (which she calls “tents”) offer another place to see paint—close to the floor and with a certain amount of mobility. They cause an amusing confusion of image and objecthood. 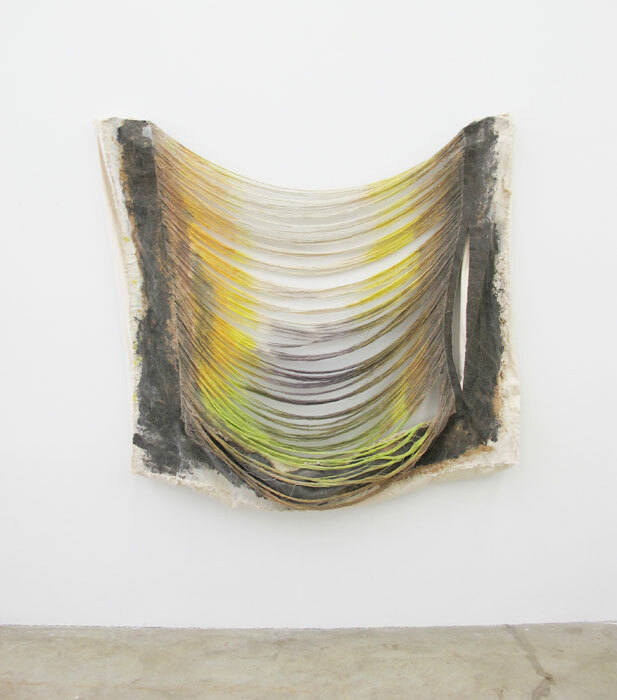 Karla Black is a sculptor who installs paint, but I think of her as an artist who strategically deploys pigment. 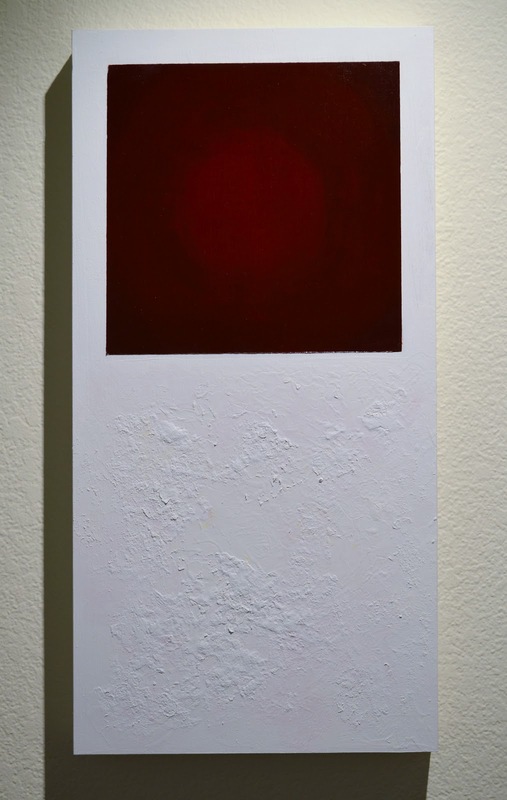 Black’s work often envelops a space with supports ranging from poly to paper, along with such things as powdered pigments and soap. As for Sharon Butler, the force behind the blog, Two Coats of Paint, her unstretched linens have struck me as furthering the evolution of paint on canvas. They’re raw and rangy, and because they’re stretcher free, one must pin them directly to the wall. It’s that matter-of-fact way in which they must be hung that gives them a casual, contingent feeling, but with a unique formal power—fold marks, loose threads and all. When canvas is used in poetic, sculptural ways, the distinction between disciplines falls and hybrid areas arise. Jess Fuller and Noam Rappaport occupy two of those hybrid areas. Fuller doesn’t just paint on canvas; she dissects it, removing some threads and leaving the canvas to slouch ever so curiously. 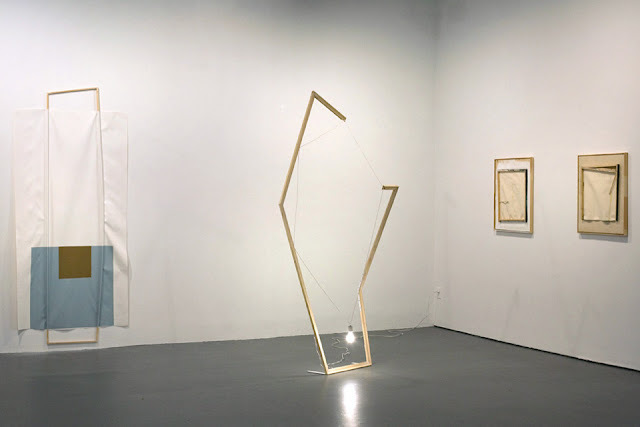 It’s not a precise method, which is part of the poetry here; things (the canvas itself) just fall into place, something akin to a Robert Morris felt piece, but with more manipulation from the hand of the artist. 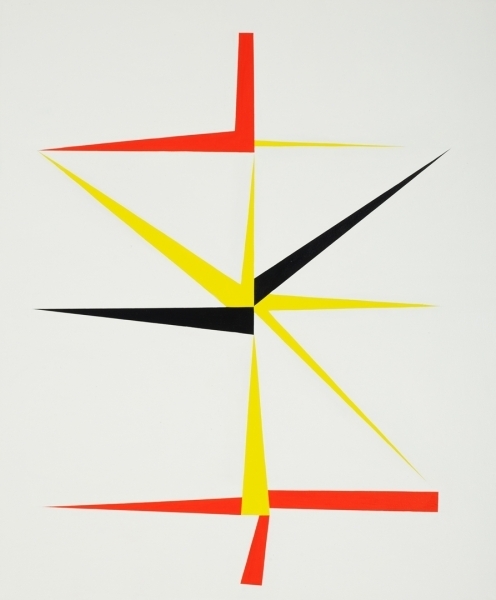 Noam Rappaport is a great example of an artist who’s bridging painting and sculpture. 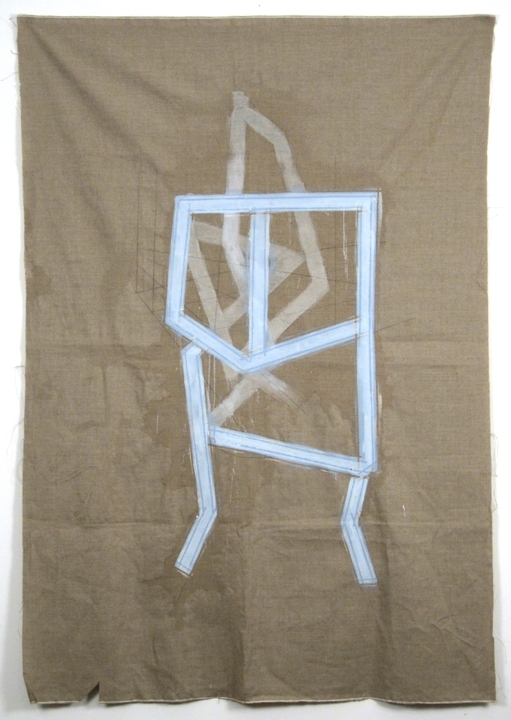 Often using a combination of metal, wood, fabric, and paint, Rappaport’s work is unique in the rather comfortable amount of rigor that it maintains. There’s a mix of relative ease and compositional experimentation. Some of his pieces are clearly read as painting, others as strictly sculpture, and a few are an equal fusion of the two. His entire body of work is a complex lesson to unravel and to learn from. 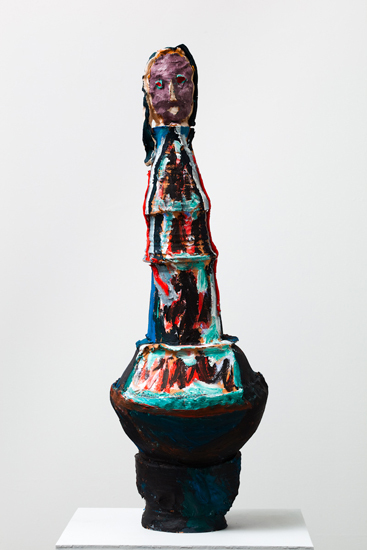 In broadening the reach of paint to found objects and to things sometimes considered sculpture, different vibes are generated that are hard to describe. A couple of instances come to mind. 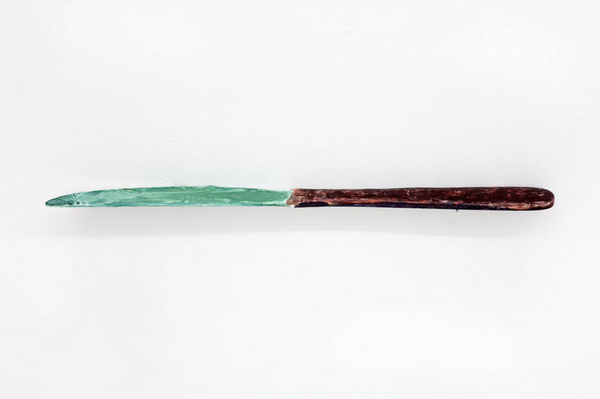 The first time I saw Hayley Tompkins’ Knife, which consists of a butter-knife with gouache applied to it, I was somehow reminded of Knife in Glass, by Richard Diebenkorn. Here was a situation in which an object loaded with paint had reminded me of a painting of a similar object—an uncanny moment for sure. 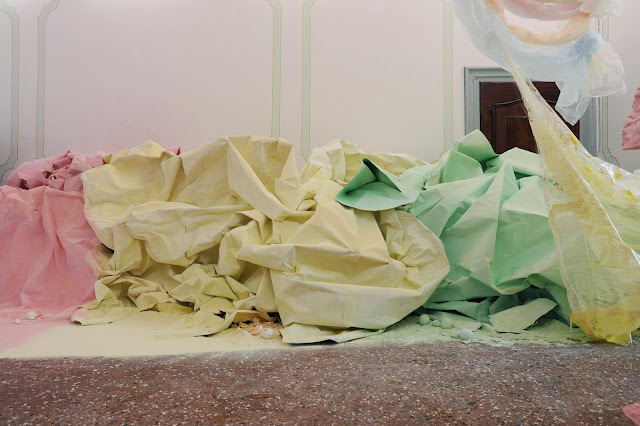 The other occurrence of paint in unanticipated places is the work of Ruby Neri; plaster and ceramic sculptures with a polychrome of oil or enamel and roots in the Otis Group. 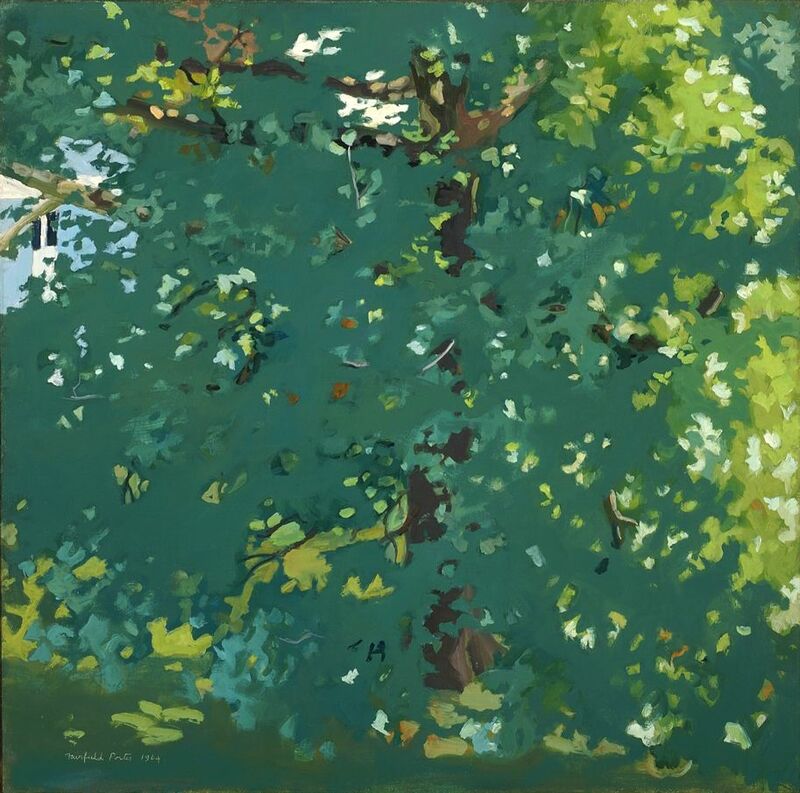 Her most figurative works look as if they just stepped out of a Jan Müller painting. 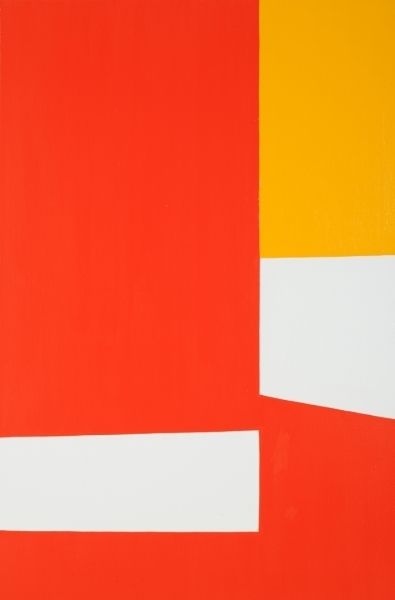 What adds to her whole situation is the fact that she also works in paint on canvas and it's apparent that both ways of working are feeding into each other. While patinated sculpture has always been done, the feeling I get from Neri’s work is the raw visual punch as color engages a surface that’s anything but flat. The work in this analysis is provisional, much of it is casual, but all of it is post-Greenbergian, very Rauschenbergian, and ravishingly Tuttleian. In trying to describe it, I grasp at the names of others because that which has come before is established fact. In so many ways, this recalculation of painting reflects a world in which information is moving faster and faster, consisting of image makers who are image laden. Through well-endowed museums, advances in printing and streaming digital, what’s already been done has all been laid out there—en masse. The ground that’s been taken serves as the point of departure and it’s that factor (and others) that contributes to the ramping up of alternative paths for painting. As a painter myself, I’ve also felt the influence of tradition versus progression and I believe the expansion of painting in recent years has come very naturally to all those involved. They’re painting how they feel, not how they should.